Cole Citrenbaum joins the Stratoblogster Young Guitar Wonder family. And amazingly, the above photo contains two other previously featured YGW's. So, someone out there is on the same track as I am. 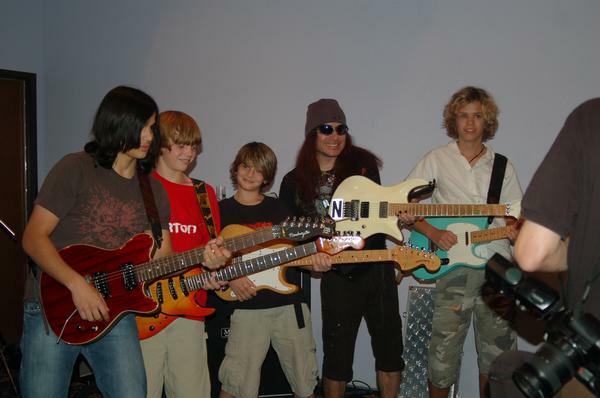 Cole (second from left in red shirt) stands next to Grant Austin Taylor - holding the natural Strat w/white pickguard. Fredrik Strand Halland is at far right holding the surf green Tele. I haven't ID'd the other two guys, but I will. Who's puttin' these guys together?? Fredrik lives in friggin' Norway! Cole is 12 years old. His myspace features tunes and videos, including a vid jamming onstage with Jonny Lang. Better check out his stuff. Oh yeah, these guys are all connected on myspace too. 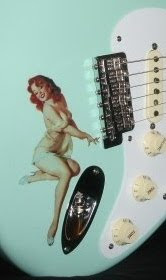 Back in January 07, I started the Young Guitar Wonders directory and referred to this phenomenon as the "Voodoo Children-- the next phase of the South Saturn Delta Force". I discovered Cole via Sam Stone, a 14 year old SoCal actor and singer who recently stopped by to comment here. Thanks Sam!